As I get older, I am now 74, I find it hard to step on slugs or to pull weeds even though I know that neither of them are good for my garden. I am not a Buddhist but somehow I am reluctant to kill a living thing no matter how low on the ladder of life. To Rosemary’s shock we found in the part of our garden bordering the back lane 8 horsetails sprouting up. Most who garden know this is a noxious weed. If you pull it (the roots underneath may go for metres) it becomes worse. A horsetail has been growing on the lane and obviously our use of pig manure, and good earth in our garden has been a culinary attraction for it. I cut them off with my rose clippers and I have scanned them for digital posterity. Some years ago I used to go to noon concerts at the Vancouver Art Gallery. The concerts were organized by Gene Ramsbottom who plays the clarinet and after having been in several leading Vancouver orchestras he is currently a teacher and lecturer at the School of Music of the University of British Columbia. Somehow I must have had a chat with him at the VAG because the subject of making clarinet (and other reed instruments) reeds came up. Ramsbottom told me that reed makers use a powder made from a version of Equisetum, called Equisetum hyemale as an abrasive polisher. Equisetum (/ˌɛkwᵻˈsiːtəm/; horsetail, snake grass, puzzlegrass) is the only living genus in Equisetaceae, a family of vascular plants that reproduce by spores rather than seeds. 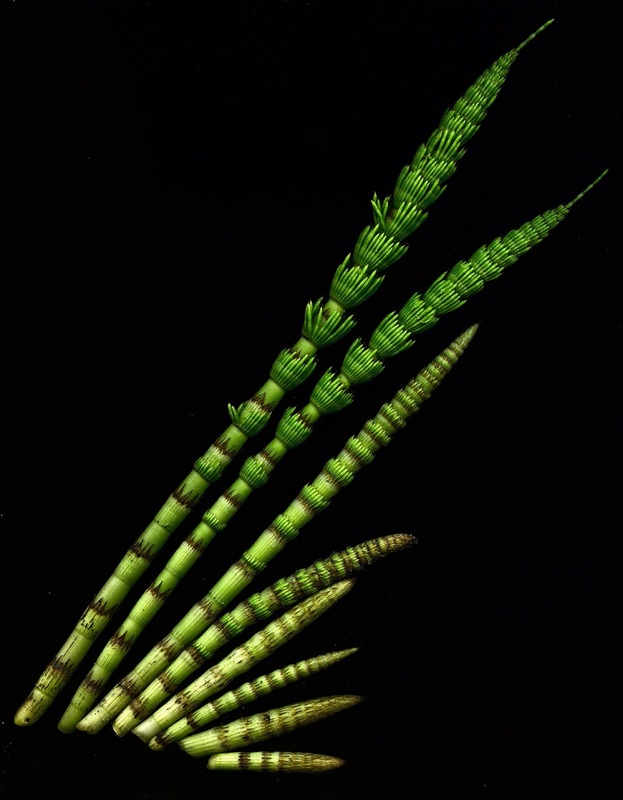 Equisetum is a "living fossil" as it is the only living genus of the entire class Equisetopsida, which for over one hundred million years was much more diverse and dominated the understory of late Paleozoic forests. Some Equisetopsida were large trees reaching to 30 meters tall. The genus Calamites of the family Calamitaceae, for example, is abundant in coal deposits from the Carboniferous period. A superficially similar but entirely unrelated flowering plant genus, mare's tail (Hippuris), is occasionally referred to as "horsetail", and adding to confusion, the name mare's tail is sometimes applied to Equisetum . The pattern of spacing of nodes in horsetails, wherein those toward the apex of the shoot are increasingly close together, inspired John Napier to discover logarithms.